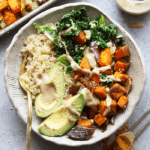 If you are looking for a delicious and healthy recipe to make for dinner tonight, try this sweet potato vegan buddha bowl recipe. This buddha bowl recipe is ready in under an hour and is packed with veggies, whole grains, and tasty tahini. 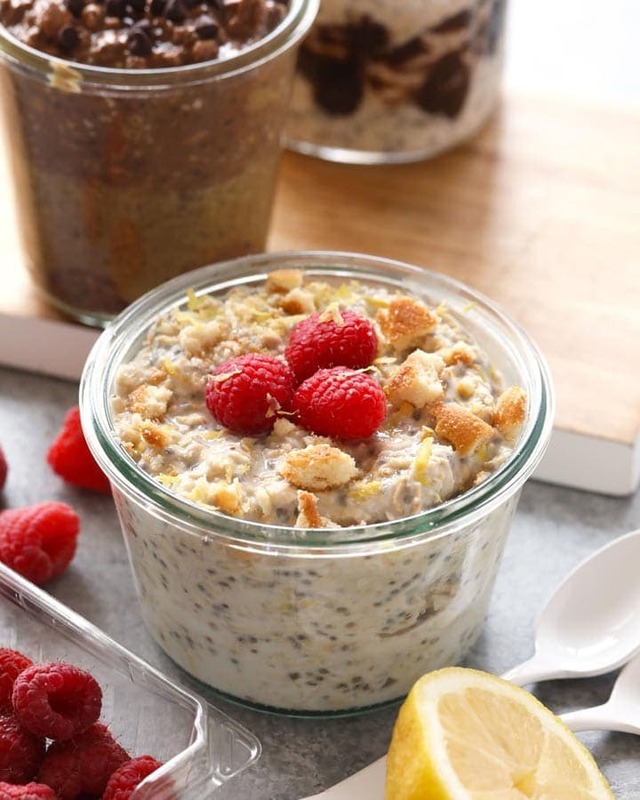 It is perfect for a meatless dinner or for a meal-prep lunch for the week. It’s MONDAY and it’s the last week of March! That means April showers are within our reach, people! Hang in there. 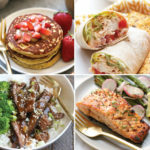 I am so excited for this week because Lee and I have so many delicious recipes to test, I love Easter, AND that means that Emily starts full time with Team Fit Foodie in only one week! This is something that we have been working towards as a team for two and half years and it’s finally happening. Yes, Emily is my sister-in-law, friend, and now officially my co-worker. I could not be more excited! People always ask me if it’s ever hard to work with your sister and my answer is yes, of course! However, the times that it is easier to work with Emily outway the hard days by a long shot. FOR REALZ. I am so blessed to have someone in my life that understands so many different parts of my life. Emily and I are able to work together for the same reasons that Lee and I are able work together, we COMMUNICATE. We talk, even about the hard stuff. It’s something as humans that we all struggle with sometimes, so why not do it with one of your favorite people? 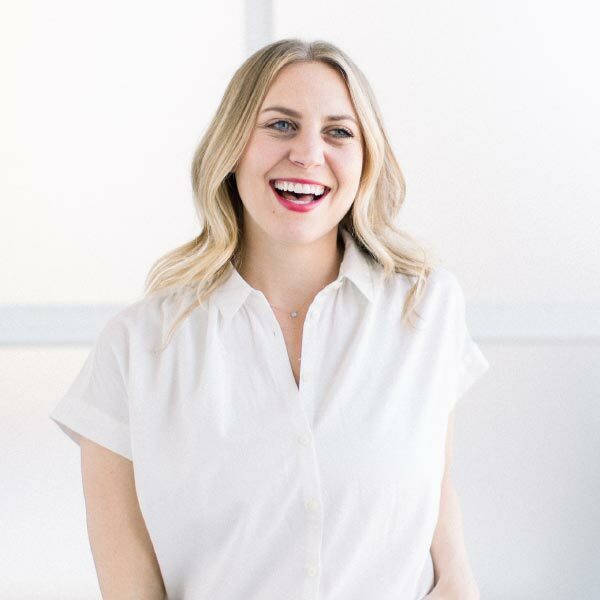 Any-who–> get ready for some get-to-know you posts, Instagrams, and more with Team Fit Foodie’s newest full-time member. WE CAN’T WAIT. Another thing Team Fit Foodie is very passionate about is—> buddha bowls. We love meal-prep bowls of all kinds, but there is just something about buddha bowl recipes that we absolutely love. What is the difference between buddha bowls and regular bowls, you ask? Buddha bowls are generally vegetarian or vegan. Sometimes it is nice to take a break from animal protein and we generally do that with a buddha bowl recipe. If you are new to buddha bowls, check out THIS post that Lee wrote a while back. It goes over the anatomy of a buddha bowl and goes into a bit more detail regarding how to mix and match different ingredients to mix things up. 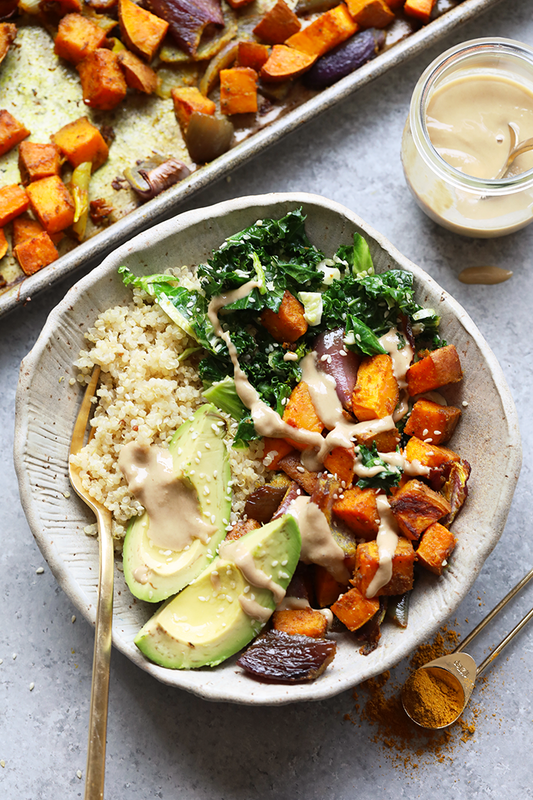 This Sweet Potato Vegan Buddha Bowl Recipe is a mixture of all of our favorite things. Sweet potatoes, garlicky kale, quinoa, and tahini! If you are looking for an easy dinner recipe this vegan buddha bowl recipe is for you. Below are some general buddha bowl staples and ingredients that we always have on hand in the Fit Foodie kitchen. PS: you need these 3-compartment glass meal-prep containers. LIKE STAT. 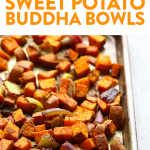 If you are looking for a delicious and healthy recipe to make for dinner tonight, try this sweet potato vegan buddha bowl recipe. This buddha bowl recipe is ready in under an hour and is packed with veggies, whole grains, and tasty tahini. 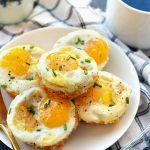 It is perfect for dinner or for a meal-prep lunch for the week. Place vegetables on baking sheet and drizzle with olive oil. Then sprinkle on spices. Massage the spices into the vegetables with your hands. When olive oil is fragrant, add garlic. Nutrition information does not include tahini or sesame seeds.